Abstract: The most frequent causes of leg ulcers are chronic venous disease (CVD) related mainly to venous hypertension and peripheral arterial disease (PAD) related to disseminated atheromatous lesions in lower limb arteries. In 15%–21% of patients, ulcers of mixed venous-arterial etiology occur, which are usually more resistant for conservative therapy (compression therapy, pharmacotherapy, wearing elastic stockings, leg elevation and massage, change of lifestyle, and regular physical exercises). The contemporary model of complex therapy of leg ulcers in the course of chronic venous and arterial insufficiency more often also comprises numerous physical therapy procedures as associated therapy. This paper presents beneficial results of treatment applied to a 58-year-old patient with 1-month lasting painful chronic ulcers of both shins of mixed venous-arterial etiology, resistant to conservative therapy, which was performed by using the device Laserobaria-S for local combined physical therapy including simultaneous action of hyperbaric oxygen, extremely low-frequency (ELF) variable magnetic field, and low-energy light radiation. 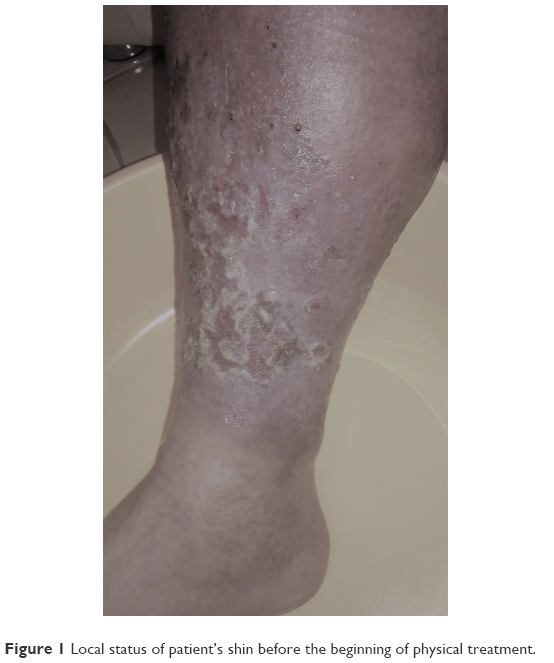 As a result of a 9-week therapeutic cycle consisting of 30 daily procedures, a complete healing of ulcers in both shins with accompanying subsidence of pain and substantial reduction in the intensity of local inflammation around the ulcer was obtained. The patient reported no side effects, and no complications were observed during the therapy. The most frequent causes of formation of leg ulcers are chronic venous disease (CVD) and more rarely peripheral arterial disease (PAD). Chronic venous insufficiency (CVI) is a condition resulting from the hemostasis in veins. The main cause of CVI is the injury of the veins transporting blood from lower extremities to the heart. Venous valves have to function efficiently for the blood to be able to cope with gravity without problems. Disturbances make a part of the blood return (the so-called venous reflux), and thus remain in the veins, extend them, and hamper their proper functioning. This may lead to the formation of lasting swelling of lower limbs, which in turn may result in chronic trophic lesions or varicose ulcers in the shin.6 Actually venous hypertension is considered as primary cause of symptoms of CVI, among them skin lesions resulting in the formation of venous leg ulcers.7 Venous hypertension is thought to cause CVI by the following sequence of events: increased venous pressure transcends the venules to the capillaries, impeding flow, low-flow states within the capillaries cause leukocyte trapping, trapped leukocytes release proteolytic enzymes and oxygen-free radicals, which damage capillary basement membranes, then plasma proteins, such as fibrinogen, leak into the surrounding tissues, forming a fibrin cuff, next interstitial fibrin and resultant edema decrease oxygen delivery to the tissues, resulting in local hypoxia which results in the formation of inflammation and tissue loss. Taking into account that mechanisms of therapeutic action of the above-mentioned physical factors are complementary to one another, in the group of patients with chronic leg ulcerations of various origin, one can expect beneficial effect of simultaneous action of those physical factors on the course of the process of wound healing, which could have an additive or synergistic character. A written informed consent has been provided by the patient to have the case details and any accompanying images published. A 58-year-old patient diagnosed previously with CVD in stage C6EnAsPo of the CEAP classification was admitted to Department of Internal Medicine, Angiology and Physical Medicine of Medical University of Silesia in Katowice due to ulcers of both shins, caused by chronic mixed venous-arterial insufficiency and accompanied by acute pain, which appeared for the first time in his life and lasted for 11 months in spite of the treatment. The medical documentation revealed that the patient had been previously hospitalized a few times – during those hospitalizations and in ambulatory treatment, various forms of standard pharmacotherapy were used (pentoxifylline, sulodexide, and local antiseptic therapy), as well as daily local wound management and compression therapy by using stretching stockings were applied, due to above diagnosis, yet with no significant improvement. So far in the patient’s treatment, no methods of physical therapy were applied. Additionally, the patient was efficiently treated for arterial hypertension and hypercholesterolemia. He did not suffer from any other comorbid diseases that affect the healing of type 2 diabetes. The patient was moderately overweight with the body mass index (BMI) value of 27.5 kg/m2. He did not smoke tobacco, and he used to drink alcohol only occasionally. The physical examination at admission performed according to Romanelli et al31 revealed extensive trophic lesions in both shins with accompanying numerous shallow ulcers of variable size with maximal surface of a single ulcer ~30 cm2 located around the shin in connection with each other, thus encircling the shin and covering in total of about 25%–50% of its surface. All ulcers had irregular sloping edges, bottom with fibrinous, granulating base, and low exudate levels. Nearby ulcers of persistent inflammatory lesions of the skin of dermatitis type, dark brown in color with accompanying atrophic changes of the hypodermis, were observed. The shins were stretched and very painful, with the presence of slight edema and purulent coating before debridement. Also, a fibrous ring was noted above the ankles, constricting the entire shin circumference (the extremity looked like a champagne bottle standing upside down). Tremulous pulse in lower limb arteries, particularly in the area of dorsal arteries in both feet, posterior tibial arteries, and popliteal arteries, was detected. In Figure 1, the local status before the beginning of therapeutic cycle is presented only for right shin, as it was practically equal as in other one. Figure 1 Local status of patient’s shin before the beginning of physical treatment. In the Doppler ultrasound imaging, numerous sites of stenosis in small saphenous and popliteal veins in both the lower extremities without significant signs of venous reflux, as well as many calcifications in vessel wall, typical for profound atherosclerotic lesions and significant stenosis sites in arteries at various levels, especially in popliteal, radial, posterior tibial, and dorsalis pedis arteries with substantial hemodynamically significant stenosis in most of them, were found. The value of ankle-brachial index (ABI) for right leg was 0.8 and for left leg was 0.7, which are indicative of moderate ischemia of both legs in the course of PAD and accepted as end point for high compression therapy. Before and after the end of the treatment, the subjective assessment of accompanying pain intensity was also performed by the patient, with the use of visual analog scale (VAS; 0 points – no pain experienced, 10 points – maximum intensity of pain). Before the beginning of the therapeutic cycle, the score was 8.
low-energy red light with the wavelength of 650 nm and ultraviolet radiation with the wavelength of 410 nm. The therapeutic cycle comprised a total of 30 daily procedures, performed once a day for 5 weekdays and interrupted for Saturday and Sunday. The cycle was divided into two series of 15 procedures, with a break of 3 weeks between them. During the procedure, which lasted for 30 minutes each time, the patient was sitting, while both his legs, one by one (the left leg followed by the right one), were placed inside the therapeutic chamber, which was closed by means of a sealing sleeve (Figure 2). After each procedure, in order to provide antisepsis and mechanical protection, the wound was provided with antiseptic dressing, and compression therapy with Coban bandage for 7 hours daily on both the legs was applied. The chamber was disinfected after each procedure. During the therapeutic cycle of Laserobaria-S procedures, a standard pharmacotherapy (pentoxifylline, sulodexide, MPPP-micronized purified flavonoid fraction and acetylsalicylic acid) was also applied. Figure 2 The device Laserobaria-S for local combined physical therapy procedures. Throughout the therapeutic cycle, dynamic healing of wounds has been observed, along with gradual generation of new granulation tissue and progressing epidermization process. Ultimately, as a result of therapeutic cycle (9 weeks in total), the ulcers healed completely at the same time in both the legs, and moreover, the pain subsided altogether (subjective pain intensity in the VAS score was estimated by the patient as 0 points). Also, a substantial reduction in the intensity of local inflammation around the ulcer was observed. The patient reported no side effects, and no complications were observed during the therapy. The local status of both the legs after completion of the therapeutic cycle with the use of Laserobaria-S device (a total of 30 procedures) is presented in Figure 3. Figure 3 Local status of both the legs after the end of therapeutic cycle with the use of the device Laserobaria-S. The positive result of treatment allowed the patient to return to fully independent life and to come back to his activities of daily living. After the end of hospitalization, according to actual guidelines,15,25 the continuation of modified compression therapy (pressure below 40 mmHg at the ankle level due to arterial insufficiency) using a stiff system with frequent reassessment and monitoring for ischemia and pressure damage, wearing of elastic stockings, pharmacotherapy (pentoxifylline, sulodexide, MPPP-micronized purified flavonoid fraction, and acetylsalicylic acid), as well as reduction of body mass to the value of BMI <25 kg/m2, total avoidance of condiments, and increase of the intensity of physical activity (walking exercises) were recommended. The search for various solutions that may enhance the efficacy of treatment of chronic wounds still remains a substantial clinical challenge and requires extensive knowledge as well as abilities in treatment planning. In the medical practice so far, this knowledge has often not been complete or limited due to high costs of suitable equipment, thus the application of routine therapeutic procedures prevailed. The results of treatment achieved in the patient described above indicate that the application of physical procedures in the form of combined physical therapy applied by using one device constitutes an efficient method supporting classical wound treatment. The device applied in this method is relatively cheap and easy to operate, and the costs of the treatment including mainly the purchase of hyperbaric oxygen and materials for disinfection, as well as depreciation of the device, are lower as compared to routine treatment (longer time of hospitalization, consumption of more time of nurses and doctors, expensive antibiotics, and wound dressings).33,34 Moreover, the method itself is well tolerated by patients and does not cause negative side effects. However, some negative sides of this form of therapy should be mentioned; as for the safety reasons regarding the use of hyperbaric oxygen, there is a need of daily treatment in medical institution with the exclusion of the ambulatory treatment at patient’s home and the potential possibility of infection despite disinfection measures after each procedure could not be excluded. The application of physical procedures in the form of complex therapy with the use of Laserobaria-S device is potentially effective in patients with chronic mixed venous-arterial etiology leg ulcers, as it enables to achieve a complete healing of ulcer and subsidence of pain in relatively short time, without any complications or side effects. In future, after carrying out randomized clinical trials regarding the therapeutic efficacy and safety of this method, it could be an advantageous supplement to the standard methods of treatment of mixed venous-arterial etiology leg ulcers. Gloviczki P, Comerota AJ, Dalsing MC, et al; Society for Vascular Surgery; American Venous Forum. The care of patients with varicose veins and associated chronic venous diseases: clinical practice guidelines of the Society for Vascular Surgery and the American Venous Forum. J Vasc Surg. 2011;53(5 Suppl):2S–48S. Mallick R, Raju A, Campbell C, et al. Treatment patterns and outcomes in patients with varicose veins. Am Health Drug Benefits. 2016;9(8):455–465. Mcardle M, Hernandez-Vila EA. Management of chronic venous disease. Tex Heart Inst J. 2017;44(5):347–349. Petherick ES, Cullum NA, Pickett KE. Investigation of the effect of deprivation on the burden and management of venous leg ulcers: a cohort study using the THIN database. PLoS One. 2013;8(3):e58948. Augustin M, Brocatti LK, Rustenbach SJ, Schäfer I, Herberger K. Cost-of-illness of leg ulcers in the community. Int Wound J. 2014;11(3):283–292. Barańska-Rybak W, Komorowska O. Skin lesions in venous disorders. Forum Medycyny Rodzinnej. 2012;6(1):35–42. Lee BB, Nicolaides AN, Myers K, et al. Venous hemodynamic changes in lower limb venous disease: the UIP consensus document. Int Angiol. 2016;35(3):236–352. Jawień A, Grzela T. Epidemiology of chronic venous insufficiency. Przegl Lek. 2004;8:30–34. Bergan J. Molecular mechanisms in chronic venous insufficiency. J Dtsch Dermatol Ges. 2006;4:627–628. Rabe E. Study B vein. Phlebology. 2006;59:179–186. Padberg F Jr, Cerveira JJ, Lal BK, Pappas PJ, Varma S, Hobson RW. Does severe venous insufficiency have a different etiology in the morbidly obese? Is it venous? J Vasc Surg. 2003;37(1):79–85. Au TB, Golledge J, Walker PJ, Haigh K, Nelson M. Peripheral arterial disease – diagnosis and management in general practice. Aust Fam Physician. 2013;42(6):397–400. Gogalniceanu P, Lancaster RT, Patel VI. Clinical assessment of peripheral arterial disease of the lower limbs. N Engl J Med. 2018;378(18):e24. Tsai S, Dubovoy A, Wainess R, Upchurch GR Jr, Wakefield TW, Henke PK. Severe chronic venous insufficiency: magnitude of the problem and consequences. Ann Vasc Surg. 2005;19(5):705–711. Harding K, Dowsett C, Fias L, et al. Simplifying Venous Leg Ulcer Management. Recommendations from an Expert Working Group. London: Wounds International Enterprise House; 2015:1–25. Callam MJ, Harper DR, Dale JJ, Ruckley CV. Arterial disease in chronic leg ulceration: an underestimated hazard? Lothian and Forth Valley leg ulcer study. Br Med J (Clin Res Ed). 1987;294(6577):929–931. Moffatt CJ, Franks PJ, Doherty DC, Martin R, Blewett R, Ross F. Prevalence of leg ulceration in a London population. QJM. 2004;97(7):431–437. Sauer K, Rothgang H, Glaeske G. BARMER GEK Heil- und Hilfsmittelreport 2014. Siegburg: Asgard Verlagsservice GmbH; 2014. Available from: http://www.zes.uni-bremen.de/uploads/News/2014/140916_Heil_Hilf_Report_2014.pdf. Accessed August 13, 2018. Słowiński P, Krosny T, Raciborski W, Staszkiewicz W. The current views on the formation and treatment of venous leg ulcers. Prog Med. 2012;3:27–34. Mcdermott MM, Criqui MH. Ankle-Brachial Index Screening and Improving Peripheral Artery Disease Detection and Outcomes. JAMA. 2018;320(2):143–145. Caggiati A, Rosi C, Franceschini M, Innocenzi D. The nature of skin pigmentations in chronic venous insufficiency: a preliminary report. Eur J Vasc Endovasc Surg. 2008;35(1):111–118. Szewczyk MT, Jawień A, Cwajda J. Integral disturbances of skin in chronic venous insufficiency and crural ulceration. Post Derm Alergol. 2005;3:145–149. Partsch H. Varicose veins and chronic venous insufficiency. Vasa. 2009;38(4):293–301. Geryk J, Bieniaszewski L. Chronic venous insufficiency – patophysiology, clinical picture and treatment. Choroby Serca i Naczyń. 2009;6:138–143. Wittens C, Davies AH, Bækgaard N, et al. Editor’s Choice – Management of Chronic Venous Disease: Clinical Practice Guidelines of the European Society for Vascular Surgery (ESVS). Eur J Vasc Endovasc Surg. 2015;49(6):678–737. Pasek J, Stanek A, Pasek T, Sieroń A. Physical medicine as an opportunity for improving the health state of patients with vascular diseases. Acta Angiol. 2012;18(3):93–98. Pasek J, Cieślar G, Sieroń A. Selected procedures of combined therapy. Rehabil w Prakt. 2017;5:17–24. Pasek J, Pasek T, Sieroń A. Magnetostimulation in the treatment of crural vein ulceration. Int Wound J. 2012;9(5):566–569. Landau Z. Topical hyperbaric oxygen and low energy laser for the treatment of diabetic foot ulcers. Arch Orthop Trauma Surg. 1998;117(3):156–158. Romanelli M, Dowsett C, Doughty D, et al. World Union of Wound Healing Societies (WUWHS) Position Document. Advances in wound care. The Triangle of Wound Assessment. London: Wounds International; 2016:1–30. Sieroń A, Pasek J. Laserobaria–S new apparatus in physical medicine to the treatment of chronic wounds. Rehabil w Prakt. 2016;4:68. Probst S, Seppänen S, Gethin G, et al. EWMA Document: Home Care – Wound Care. J Wound Care. 2014;23(5 Suppl):S1–S44. Hampton S, Lindsay E. Empowering patients to take control of leg ulcer treatment through individualised management. J Wound Care. 2005;14(5):238–240.